Villa fully air conditioned for your comfort, views of the holy mountain victory in a pine forest of 2000 m², terrace of 70 sqm in teak with barbecue, pool, bowling, summer kitchen with bar equipped with a fridge -congèle, a fryer, gas burners and a Nespresso coffee all illuminated to enjoy the long summer evenings until the end of the night; calm, sun, cicadas. The villa is located in a gated community with only 8 villas, each has a land area of ​​2000 m² and its own pool which gives very little overlooked. The quiet residence is surrounded by a fence and closed by an automatic gate with a code which gives a minimum passing cars (usually residents of villas). The villa has two bathrooms with bathtubs and washbasins. Two separate toilets in bathrooms. Toilet linens are provided. pool and teak terrace of 80 sqm with 8 chairs, a hammock and beautiful teak 4 parasols. Pool hoose fully equipped with bar facing the swimming pool and bowling options to staying on the chairs. Everything is equipped with lighting to enjoy as long as we want the outside. Barbecue. This year (and the request of many guests) the villa was fully air conditioned to to be able to relax and have soft, restful nights. Vacationers will be invited smokers to smoke al 'outside the villa but it I think it will happen naturally. Merci , très heureux que la localisation de la villa proche de la ville mais située en campagne aixoise vous est comblé .Soyez le bienvenu avec votre famille. The support(medium) of the shower head was changed dice that I had knowledge, for the plancha she(it) is not planned in the equipment of the villa but I added him(it) this year to see, it works very well it is just enough to change the gas cylinder has the station(resort) of quoted(esteemed) and not to forget to put out(switch off) after the cooking .quand in beach towels it is indicated well in the description that they are not supplied because often damaged after the week and I cannot change 8 towels(briefcases) of this size constantly nor to take them in the plage. Our group of seven, 3 adults and 4 teenagers stayed here for a week in July and had a wonderful experience. We found the location just outside of Aix to be excellent for exploring the area and for soaking in the Provencal atmosphere. We were able to explore Aix, and also visited Marseille, Cassis, Sainte Maxime, La Baux, St. Remy and several towns in the Luberon. 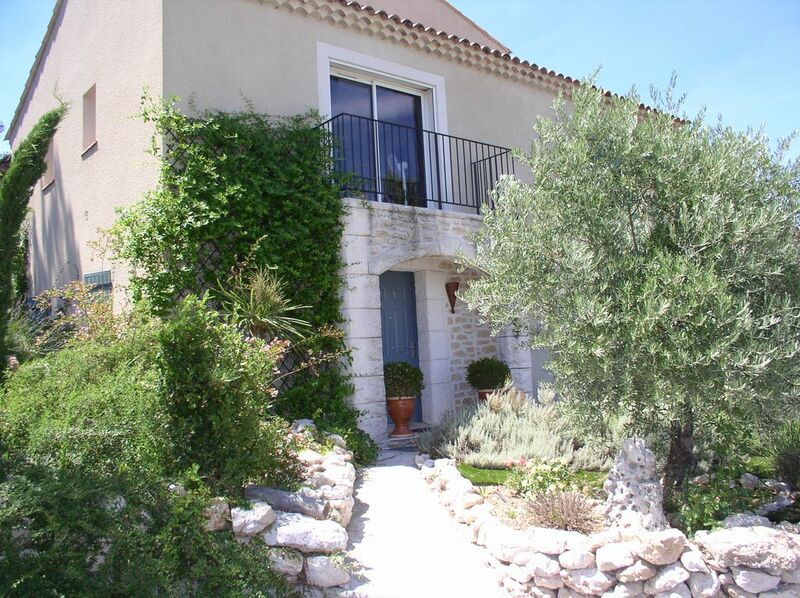 The villa is well laid out, The pool area is situated on a slope above the house, with wonderful views of Montagne St. Victoire and the surrounding farmland. Below that is the patio area with a large dining table, some very comfortable lounge furniture, a charcoal grill and a propane flat top. Inside, the villa is split on three floors. There is a small bedroom on the entrance floor, a master bedroom, kitchen and living area on the main floor which leads to the patio, and 2 small bedrooms and a bathroom upstairs. The villa was clean, comfortable, well appointed and attractive. The owner Vincent was very nice and helpful, even though we did struggle a bit with communication, as we spoke no French and he no English. Overall we had a great stay, loved Provence, and found the location of the villa to excellent! One suggested activity, about 1 1/2 hours from the villa is the Carrieres de Lumieres near La Baux. An amazing experience of art and music inside an abandoned quarry in the Alpilles. Très belle villa,piscine agréable,nous avons passé une super semaine,les propriétaires sont très sympas et discrets,Nous avons eu 2 jours de vent mais cela ne nous a pas empêché de nous baigner .possibilité de revenir l'année prochaine. Wir haben hier mit 2 Kindern Urlaub gemacht, die Lage ist schön zentral, für alle Ziele in der Provence und der Camargue. Allerdings zum Einkaufen muß man mit dem Auto fahren, und in der näheren Umgebung gibt es auch nichts Interessantes, so daß man immer das Auto nehmen muß. Das Haus ist groß genug, um sich aus dem Weg zu gehen, und auch die insgesamt 4 Schlafzimmer geben einem genug Platz. Der Pool war im August schön warm (28-29 Grad) und sauber. Das Haus bzw. der Garten liegen an einem Hang, das Haus ist durch diesen Hang von der Umgehungsstraße getrennt, so daß es im Haus in den Schlafzimmern absolut ruhig ist. Der Pool allerdings liegt oberhalb am Hang, ist dadurch vom Haus nicht einsichtig (wichtig bei kleinen Kindern), und man hört dort die Umgehungsstraße sehr deutlich, so daß wir oft unten am Haus gesessen haben, was schade ist, da vom Pool der Blick viel schöner war. Auch das Haus war insgesamt sauber, allerdings wird es offenbar grundsätzlich von den Mietern gereinigt, bis 10:00 am Abreisetag, vermutlich mit unterschiedlicher Motivation / Gründlichkeit. Auch war uns nicht klar, daß der Eigentümer im selben Haus in einer Einliegerwohnung wohnt. War letztlich kein Problem, und kann sicher auch seine Vorteile haben, wenn etwas kaputt geht. the villa is ideally located in Aix countryside overlooking a splendid farmhouse with panoramic views of the holy victory and its surroundings. Has yet you are 10 minutes from downtown Aix, its restaurants, unique shops, its markets and the famous Cours Mirabeau and shady terraces. Access to highways for Marseille, Cassis, La Ciotat or St Tropez, Nice (1 hour 30) or go shopping at the famous campaign plan (10 min). The nearest beaches about 20 min.